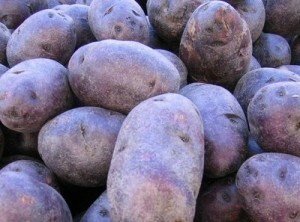 Did the bluenoser nickname come from blue potatoes? Why are Nova Scotians called Bluenosers? The Bluenose schooner is famous around the world but the nickname dates back long before the boat was built and launched in Lunenburg. Other people put the name down to the thick wool mittens worn by fishermen, dyed blue by their families to add a bit of colour. Out on the cold and windy waters of the Atlantic Ocean, running noses and watering eyes would have been common. Using the mittens to wipe their faces would have left blue dye on the fisherman’s nose. Still another theory is that the word refers to the colour most Nova Scotian noses turn during frigid winters. A final idea is that the name comes from a blue-skinned potato that was once grown in the Annapolis Valley. We’ll probably never know for certain why Nova Scotians get the nickname ‘Bluenosers’ but today the name is indelibly marked into the province’s culture.